Whether you’re creating a new website or designing a flyer for your business, one of the most important elements of your design is images. It’s important to pick good photos that will not only resonate with your audience, but also be memorable—reinforcing your brand and ultimately enticing customers to purchase your product or enlist your services. Good photos generate 87% more engagement on social media posts. If a person hears a piece of information, they are only likely to remember 10% of what they heard three days later. If they see a piece of information, they are likely to remember as much as 65% of the information three days later. When people follow directions that include images, they complete the task 323% better than those who are only allowed text directions. Photo Quality: It’s no secret, the more visually appealing a photo is, the more likely it is to get noticed, and more importantly, the more likely it is that the photo will generate some kind of reaction. 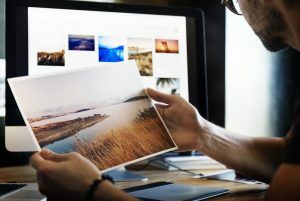 Before choosing a photo to use, take the time to make sure your shots have great composition, are in focus, and will pique your fans’ attention. Make it a goal to use only high-quality photos. Human Element: While we’re suckers for great shots of animals and landscapes, don’t forget to use pictures of humans, too. Often marketers get the best traction with photos of other people. We are naturally drawn to the human element, and we all love seeing photos of interesting and relatable people. On-Brand: Every company has a brand standard of fonts, colors, and types of graphics used; some are more controlled than others. When choosing which photos to use, consider your collection as a whole and choose images that “fit”’ well with the others. You want your photos to collectively tell a story, and choosing photos that fall within the standards of your brand will help you do so. Elicit Emotion: Any good marketer will tell you that the best way to capture an audience is to make them feel something. One of the best ways to do this is through the use of great images. Look at a photo you’re considering using. Does it make you happy? Does it bring a bit of a tear to your eye? Choosing photos that cause you to pause and think about them are the best for marketing because they will ultimately cause your audience to stop and notice your product, too. Variation: While we recommend that photos are on-brand, we also recommend varying your photos often. If someone sees an image they’ve seen before, they are much less likely to pay attention than if it’s a new and fresh photo. Continually look for new opportunities for great shots, and don’t be afraid to experiment with new locations, subjects, and compositions. Stock vs. Real: The age old debate about whether it’s best to use a stock photo—one that someone took for you—or one you took yourself will probably be around until the end of time. While many companies can get away with using stock photos, consumers are more aware of the practice now and it’s getting harder and harder to stand out with stock shots alone. It’s much more powerful to use your own photos with your own products or people in them, as they will undoubtedly resonate with your fans more. Photography is an incredibly important piece of the marketing puzzle. The ability to successfully shoot amazing images and pick photos that work is a valuable skill for anyone working in the marketing industry. The Digital Workshop Center in Denver and Fort Collins, Colorado, offers complete photography and marketing classes for anyone looking to improve their skills or switch careers. Click here to learn more about our programs and see the full schedule. We’re here to help you gain the skills you need to successfully represent and sell your products or services through the use of images that work and other key marketing competencies.